Richard Bustillo of Rick Case Honda says Facebook is taking advantage of new opportunities to reach customers by putting ads directly in news feeds. 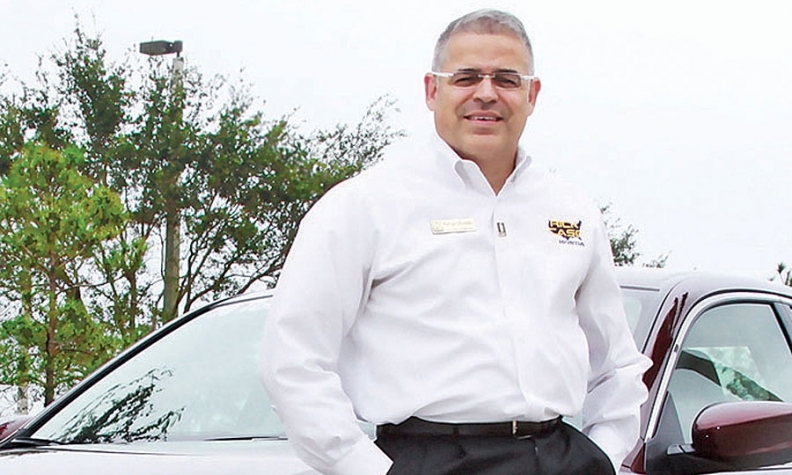 Richard Bustillo, general manager of Rick Case Honda in Davie, Fla., believes Facebook has finally cracked the code to help dealerships sell vehicles and service. Marketers have long viewed Facebook as an online cocktail party -- fine for socializing but weak for selling cars. Now that's changing. Rick Case Honda and other dealerships are starting to take advantage of Facebook's huge potential to reach customers on the users' digital home turf, by putting ads directly into their customers' news feeds. Technical improvements introduced in September allow dealerships to take their customer lists -- with just names and e-mail addresses -- and find those people on Facebook. The "custom audience" feature allows dealerships to push ads directly to Facebook users' news feeds, the must-see center column of the home page that consists of a constantly updated list of posts by a user's Facebook friends. Facebook users are more likely to look at news-feed ads than those in the more common ad location, the right side of a Facebook page, the social media giant says. "Facebook is starting to understand what we need to sell cars," Bustillo said. In June at Rick Case Honda, an employee-pricing-for-all promotion on Facebook contributed to a strong month -- 615 new vehicles sold -- the most of any Honda store nationally for the month, Bustillo said. Facebook played a key role in the campaign's success, he said. The store took its customer list with thousands of names and e-mail addresses and identified who were Facebook users. It then delivered to their news feeds the employee-pricing offer, Bustillo said. Facebook also has improved the ability of dealerships and the factories to put promotional videos in front of car shoppers, Bustillo said. Facebook users are three to four times more likely to click on a video than a static ad, the company has found. Rick Case Honda in 2012 has sold 4,238 new Hondas through Oct. 23, the third most of any Honda store nationally, the dealership said. The knock on Facebook, from a marketer's standpoint, is that although the huge social media site has been useful for automakers to promote brand awareness, it has been nearly irrelevant in the shopping process. As recently as May, Dataium, a consulting company that monitors online vehicle shopping behavior, found that of 20 million visitors to dealership Web sites, just 120 arrived there directly from a Facebook link. Of that microscopic number, only a handful left contact information to become sales leads, Dataium found. On the other hand, automakers have been building huge banks of friends and sending them soft sells, such as sponsored stories, that talk about topics such as the environment without a direct pitch for vehicle sales. Jeep, for instance, has more than 2 million Facebook fans. In an interview last week, Doug Frisbie, Facebook's head of automotive global marketing, said Facebook attained the technical capability to put ads on Facebook users' news feeds in late January. Ads placed there are more than eight times more likely than ads on the right side of a user's Facebook page to prompt a reader to comment on the item or actively "like" it, Frisbie said. Facebook refers to a user's interaction with an ad or item as "engagement." And advertisers are seeing 10 times greater recall from news-feed ads than from static ads, he said. Bustillo said he likes the news-feed ads because the dealership pays for them only when Facebook users click on them. That's similar to Google paid search. The ads also have the potential to go viral, Bustillo said. Each Facebook user has on average 130 friends, Facebook said. If a Facebook user shares an ad with friends, it has a multiplier effect of reaching people without additional cost to the dealership. The dealership pays for an ad only when the original audience clicks on it, Bustillo said. Facebook declined to say how many dealerships or automakers have used the new capabilities to find their customers on Facebook or deliver ads to news feeds. The company is watching for backlash from its users, accustomed to conversing relatively free of advertising, to having ads placed in their news feeds. "We are carefully monitoring user engagement and sentiment," Facebook COO Sheryl Sandberg said in an earnings call last week. "We look at how users are engaging on our platform, and as we've increased the number of ads and news feed we've been careful -- carefully monitoring that engagement." Joe Castle, dealer principal of Castle Chevrolet in suburban Chicago, has matched about 8,000 people on his 14,000-person customer list with their Facebook addresses. In the past three weeks, he sent to their Facebook news feeds an offer for them to buy one oil change and get one free. In the first two weeks, the campaign, which cost him about $500, generated about $12,000 in oil changes and other maintenance, Castle said. Castle Chevrolet pays Facebook about 60 cents when a customer targeted on Facebook clicks on the offer, he said. The store sold about 1,200 new vehicles in 2011. "Facebook has really dialed it in," said Castle, who also is founder of Socialdealer, a social media and reputation-management company for dealers. Facebook's features to target shoppers are evolving, Frisbie said. Within a month, Facebook expects to pilot a program with R.L. Polk & Co. that will allow automakers and dealerships to use Polk's huge database of owners to identify sales prospects, he said. "We're talking about getting the right message at the right time in front of in-market shoppers," Frisbie said. Rick Case Honda expects to make heavy use of ads and video on Facebook news feeds next year to promote the redesigned 2013 Honda Accord sedan, Bustillo said. The store is waiting to launch the campaign until early next year, though the 2013s are available now, to leave time for the store to clear 2012 models still in stock, he said. When the campaign is rolled out, Bustillo said, he intends to shoot videos to potential customers through Facebook extolling the features of the sedan. Moreover, with the help of campaign consultant Tier10Marketing.com, the store will target Accord customers with equity in their cars so he can offer them a new Accord for the same or lower monthly payments, Bustillo said. The targeting capability of Facebook makes it an economical media buy, he said. Rick Case Honda spends about 20 percent of a $250,000 monthly advertising budget on digital advertising. Bustillo said he gets his best return on investment on the $2,000 a month that he spends on Facebook ads. "I'm chomping at the bit to get started," Bustillo said of the upcoming Accord campaign.